Upper Deck Gallery has just released its newest piece of original artwork, illustrated by the talented Steve Stark. This never before seen illustration features memorable characters such as Dante Hicks and Randal Graves, depicted in some of the most memorable scenes from the movie. 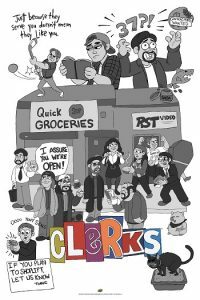 Clerks, the 1994 American comedy credited which launching Kevin Smith’s career, features a wild day in the life of two witty store clerks, Dante and Randal. The two friends have an unexpectedly exciting day that includes everything from going out of their way to annoy customers to playing hockey on the roof of the convenience store. This incredible cartoon illustration is printed on a 24” x 36” lithograph poster that depicts all the fan favorite characters from the movie, including Dante, Randal, Silent Bob, and Jay. Presented in black and white, just like the movie, the Stark illustration also includes notable scenes from the film such as the Chewlies Rep and the infamous cat on the countertop. Steve Stark has illustrated countless pieces of artwork, including the entire animated series of Clerks. Limited to 250 regular prints and 100 variant prints, this poster is a must have for any collection! Fans can purchase the new posters now at www.UpperDeckGallery.com.